Audition Palliser in our Raleigh Showroom. We have several different models and coverings on displays and in our theaters. Dim the lights, pass around the popcorn and roll the opening credits. Movie night has come home in a big way! Palliser home theatre seating provides the ultimate movie experience with features like tray tabels, cup holders, LED lighting, storage and more! Selection 85 luxurious leathers and over 200 fabrics are available in every color under the sun, including coordinated accent patterns. Making your customized lifestyle choice is easy – we’ve organized them all by color and price. Crafted You’re buying furniture that’s made right, and at home. The promise of reliability, strength and longevity is founded in our local roots, marked by over 60 years of innovation and fine craftsmanship. Environmental Plan Palliser builds to reduce waste, wastewater, emissions and supports a culture of respect and fairness. We are Authorized Palliser Dealers. 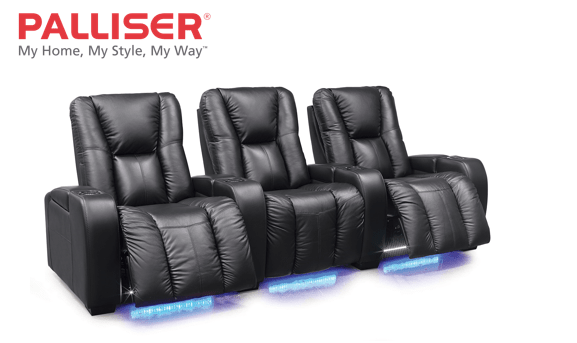 Audition Palliser Home Theater Seating for yourself! 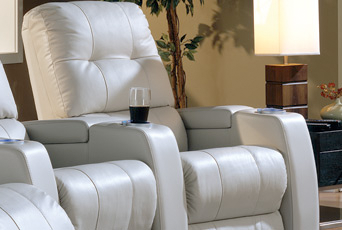 Palliser Home Theater Seat is the right choice for you and your application.